*The Wall Street Journal reports that a New York City church is asking the U.S. Supreme Court to assert its right to hold religious services in public schools. Lawyers for the Bronx Household of Faith, an evangelical congregation, filed a petition Tuesday asking the Supreme Court to review a June appeals-court ruling that would bar churches from holding worship services on school property. 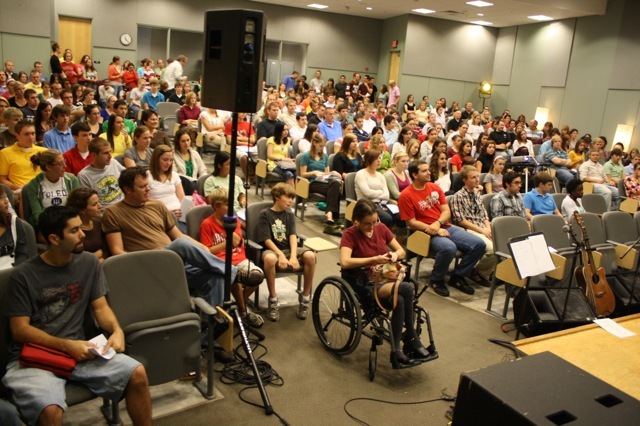 About 60 churches currently use New York City public-school auditoriums and classrooms for worship activities after school hours and on weekends. The arrangement has allowed small, cash-strapped churches to avoid the city’s high rents, as the schools charge a nominal fee to cover the costs of custodians and security staff. The debate over church use of city public-school space has been chugging through the courts since the mid-1990s. The Supreme Court has heard several high-profile cases on schools and religious life in recent years, but justices haven’t yet ruled on whether worship services should be allowed on school property. That could make the Bronx church’s case a strong candidate for the docket, said Emily Gold Waldman, an associate professor of law at Pace Law School. In 1995, the Bronx Household of Faith sued the city school board in federal court after the church’s application to meet in a school building was declined.